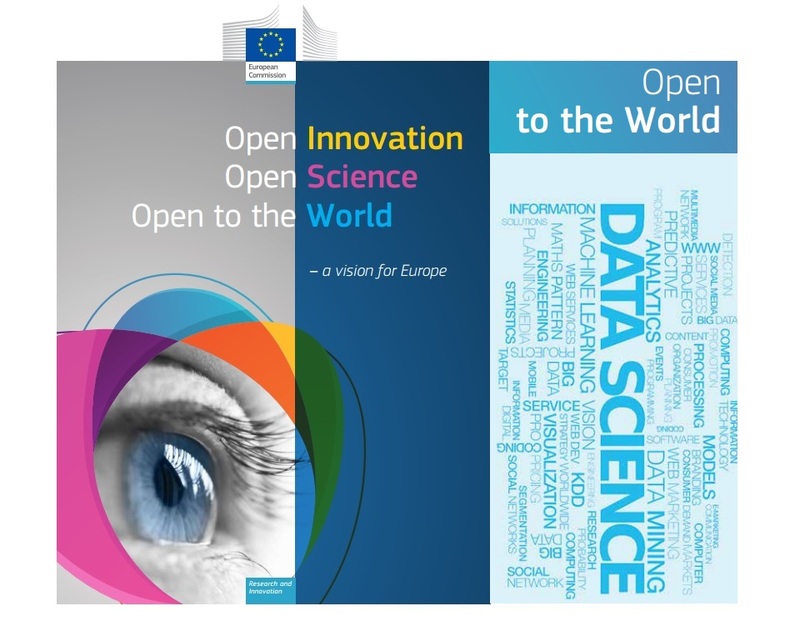 In 2016, the European Commission's Directorate-General for Research & Innovation (RTD) published a book that connects some of the key goals behind ‘Open Innovation’, ‘Open Science’ and ‘Open to the World’. The book also highlights actions that are already taking place in the implementation of the Tree Os’ and those are being prepared. In Europe, the Open Innovation goal has led to a debate on a European Innovation Council and the creation of a Seal of Excellence to facilitate links between Horizon 2020 and other funding programmes. The Open Science is gradually expressing itself through the development of a European Science Cloud and open access to scientific data and publications - generated by Horizon 2020 projects - alongside the highest standards of research integrity. The European Commission has already taken historic steps to be Open to the World by signing Association Agreements with Ukraine, Tunisia, Georgia, Armenia, Moldova to Horizon 2020, as well as international agreements with China and South American countries. Open Innovation, Open Science and Open to the World goals do not represent a new policy initiative or funding programme as such, but a way to reinforce existing Horizon 2020 programmes and reinvigorate existing policies such as the European Research Area (ERA). Horizon 2020 was designed to simplify access to funding and reduce the administrative burden for participants in a project. This entailed major simplification compared to its predecessors, including a very simple cost reimbursement model, streamlined checks and audits and the fully electronic management of grants via a participant portal. The basic premise of Open Innovation is to open up the innovation process to all active players so that knowledge can circulate more freely and be transformed into products and services that create new markets, fostering a stronger culture of entrepreneurship. A specific innovation can no longer be seen as the result of predefined and isolated innovation activities but rather as the outcome of a complex co-creation process involving knowledge flows across the entire economic and social environment. creating a well-functioning eco-system that allows co-creation becomes essential for Open Innovation. Open Innovation is gaining momentum thanks to new large-scale trends such as digitalisation and the mass participation and collaboration in innovation that it enables. represents a major interdisciplinary effort between stem cell biologists, experts in advanced drug delivery, research scientists, clinicians and research companies. In order to encourage the transition from linear knowledge transfer towards more dynamic knowledge circulation, it is essential to create and support an (open) innovation ecosystem that facilitates the translation of knowledge into socio-economic value. In addition to the formal supply side elements such as research skills, excellent science, funding and Intellectual Property management, there is also a need to concentrate on the demand side aspects of knowledge circulation, making sure that scientific work corresponds to the needs of the users and that knowledge is findable, accessible, interpretable and re-usable (FAIR). Open access to research results - an essential part of Open Science - aims to make science more reliable, efficient and responsive, and is therefore the springboard for increased innovation opportunities, for instance by enabling more science-based startups to emerge. Open Science represents a new approach to the scientific process based on cooperative work and new ways of diffusing knowledge by using digital technologies and new collaborative tools. The discussion on broadening the science base and on novel ways to produce and spread knowledge gradually evolved from two global trends: open access and open source. Open Science has the potential to strengthen and enhance science by facilitating more transparency, openness, networking and collaboration, and by fostering interdisciplinary research. Open Science, however, does not mean ‘free science’. It is essential to ensure that intellectual property is protected before making knowledge publicly available in order to subsequently attract investments that can help translate research results into innovation. Open Science has an impact on the entire research cycle, from the inception of research to its publication, and on how this cycle is organized. are creating an ‘Open Platform’ (OPPLA), a truly ‘open’ fee-free platform accessible to the wider public to provide tested, practical and tailored solutions for environmental management and decision-making and to help stakeholders to apply the ecosystem services and research results into concrete actions. Another example of Open Science initiative is the Climate Joint Programming Initiative (JPI) - a collaboration between 16 European countries to coordinate jointly their climate research and fund new transnational research initiatives. JPI Climate connects scientific disciplines, enables cross-border research and increases science-practice interaction. Being ‘Open to the World’ means striving to ensure that EU research and innovation can work at a global level through developing partnerships with other areas. To maximise their potential, the main components of the ‘Open Innovation’ and ‘Open Science’ policies should also be ‘Open to the World’. The EC is leading the way in many global research partnerships to tackle societal challenges. The results of EU research and innovation contribute to the development and implementation of important international commitments such as the UN Convention for Climate Change, the Convention on Biological Diversity, the 2030 Agenda for Sustainable Development, and Resolutions of the World Health Organisation. Post Scriptum: “I hope that the ideas and initiatives described in this book will stimulate anyone interested in European research and innovation. I would like it to encourage debate and lead to new ideas on what the European Union should do, should not do, or do differently”, - Carlos Moedas, European Commissioner for Research, Science and Innovation.